We take complete responsibility of maintaining your IT Infrastructure with our Structured & Certified RIMS team. We offer reliable end-to-end IT Infrastructure Management Services to automate your own IT Infrastructure with today’s needs & tomorrow’s readiness. 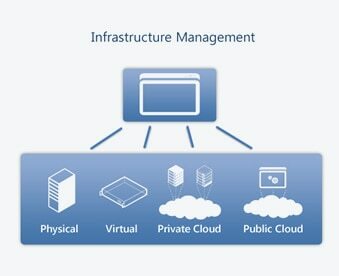 Our suggestions are designed to proactively eliminate issues in IT Infrastructure management and provide best-in-class IT infrastructure in the eco-systems of business. We monitor & manage all your mission critical servers, network & security appliances for its availability, utilization, and more per your requirement. We apprehend your requirements and cater to your specific IT infrastructure management needs. Our certified IMS team of professionals will assist you to build and manage a secure and integrated IT environment. Our eminent service will help you to adopt industries best practices with considerably enhanced service levels. We consistently deliver high quality of services, which upsurge to competitive advantages for our clients, with our robust infrastructure and streamlined processes with our internal expertise. We help your businesses, free from stress to manage the rapidly changing technology needs. Our certified domain experts will proactively work towards the server administration (Windows, Linux / UNIX, Virtualization and more). We take care of scheduled maintenance, OS Patching (Irrespective of OS), Anti-virus updates, and lot more, in the lean production hours after getting the Change Management approved from the CAB (Change Advisory Board). We work towards automating your own IT Infrastructure in the public cloud, for hosting your web applications, migrating your existing applications or even for a testing, on demand in the cloud Infrastructure. We work towards automating your own IT Infrastructure in the private cloud for hosting your web applications & for a testing purposes. We do Web server administration activities that includes hosting .dot & php application on cloud Servers including Linux, Windows at reasonable prices. Our team will ensure your infrastructure is properly launched and maintained for optimal performance. Our database administration team helps you to configure HA for your mission critical data base. Our certified team will house keep and administer the database to ensure the maximum availability of servers. We monitor your entire network (like Mail Servers, Web Servers, Database Servers, backup solutions and their Resources Utilization, Routers, Switches, Firewall and many more) for outages and afford solution to fine tune your servers & network for outstanding performance. Our certified domain experts will categorize the network related issues rapidly and provide solution quickly. We provide 24 / 7 / 365 days of proactive monitoring services to facilitate keeping your network stable. We use to conduct Vulnerability Assessment on regular intervals and patch / fix the identified vulnerabilities to keep our network more secure. We monitor threats, malicious contents and intrusions in the network perimeter appliances and vigilant the respected stack holders to take proactive steps to block the identified, unauthorized activity. Our certified domain experts provide guidance on how to prevent these types of intrusions in future. All our services enable you to cut-cost at the same time meet regulatory compliance, achieve operational efficiencies, exceed up-time targets, maintain information security across your network, reduce operation costs and enhance service performance.